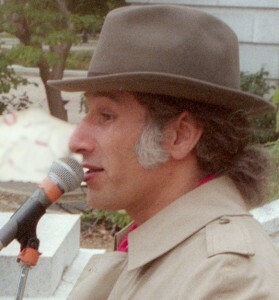 Ben Masel addresses the crowd from the north steps of the state capitol during the 1995 Great Midwest Marijuana Harvest Festival in Madison, Wisconsin. This weekend, Wisconsin lost one of its unique and colorful characters with the passing of Ben Masel. Ben and I used to shadow each other during the late 80s and early 90s. I was selling propaganda for a commune I belonged to at the time (a long story for another time), making the rounds of college towns, Grateful Dead concerts, political rallies and festivals. Ben would show up at these same venues advocating for cannabis legalization, selling propaganda and merchandise while promoting his own rallies and festivals. We first met at an Alpine Valley Dead show in 1987, where he was making a spectacle of himself cruising the parking lot handing out handbills for the Great Midwest Marijuana Harvest Festival. This was an event Ben put together each year, where advocates for cannabis legalization would gather in Madison. They’d march down State Street from the university to the state capitol, then there’d be a rally with music and speeches. I asked him if early June might be kind of early to promote an event scheduled for October, and in the middle of a parking lot filled with license plates from everywhere in the country said, “So how likely is it that I’ll run into you again between now and then?” In my case, it turned out to be pretty likely, but I got his point. He came in second in a field of three candidates in the Republican primary, getting over 5% of the vote against a popular governor (at least among Rs). It was his way to give Wisconsin’s pro-leagalization voters a chance to stand up and be counted. Later he told me that he’d “made a deal” with the Democrats by running as a Republican instead of running as an independent. That way he could run directly against Tommy Thompson in the primary without harming the Democrats in the general election. I don’t remember if he ever told me what he got from the Dems in that deal. It was around the same time that he began the Weedstock festival, a Memorial Day weekend gathering with camping and music. After a few years, it became difficult to maintain the event as localities were pressured to deny permits and attendees grew tired of getting harassed by police as they travelled to and from the event. I think it was when we crossed paths at the 21st anniversary gathering at the original Woodstock site in Bethel, New York that Ben proudly told me that “Weedstock” was a registered trademark. If he had been born at a different time, he could have been a really good lawyer. He became well-versed in the minutia of every legal document from the Constitution on down to local regulations, and he was adept at maintaining legal cover for everything he did. While petitioning for something or other (a voter initiative, to get his name on the ballot for an election… I don’t remember what it was, and that’s not important), he went to the UW Memorial Union to gather signatures. When confronted by someone telling him he couldn’t do that there, he calmly spelled out the constitutional basis and the various court cases supporting his position that political activity in a public place was protected speech, and that by removing him these same authorities would be vulnerable to severe penalties for violating his constitutional rights. He always seemed eager for a court confrontation (which after all, would always give Ben another soap box to work from), but the authorities never wanted to mess with him. Ben applied his sense of humor to everything he did, and that usually amplified his message. He was impossible to intimidate, though he wasn’t intimidating himself. In conversation, he was articulate and quick on his feet no matter who he was talking to. 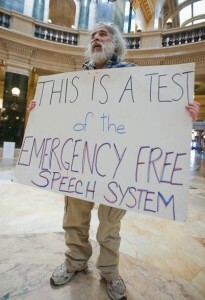 Ben Masel protesting at the Wisconsin state capitol in the spring of 2011. Everything Ben Masel did in his life seemed to connect to his activism. Unfortunately, he smoked a lot of tobacco in addition to a lot of pot, and tobacco is known to lead to lung cancer. He kept working as long as he could. He kept a blog on Daily Kos, a Facebook page, a Twitter feed, and a MySpace page. He had even begun a campaign to challenge Herb Kohl for the US Senate in 2012. While lung cancer was playing its endgame with Ben Masel, he still managed to participate in the recent protests at the state capitol. He seemed to be a presence at everything fun that happened in Madison for the past three decades at least, and he will be missed. A long time ago Ben Masel, his lady and little toddler girl would come to my apartment on important political business….sometimes we just hung out, sometimes we would get into heated discussions about the system but mostly we laughed. He will be missed but I am grateful for the memories he invokes….hey Ben I still have my copy of Black Listed in America……!!!!!! Hi Janie, I’m the little toddler girl’s mom! Her daughter is almost 6 now. Hate to say it but please give me a few clues? were you in Wisconsin or NY or CA or….? City council here made 4/20 Ben Masel Day on city calendar so we are hella busy you can probably guess. There’s a concert etc. Hope 2 hear from you.